M16 likes to hide behind hedges and tree and houses. I cannot image it before it reaches transit, and then I only get two hours on it before it hides behind the rooftops. However, the Eagle nebula makes up for its awkward location by its large brightness. This is a very bright object. 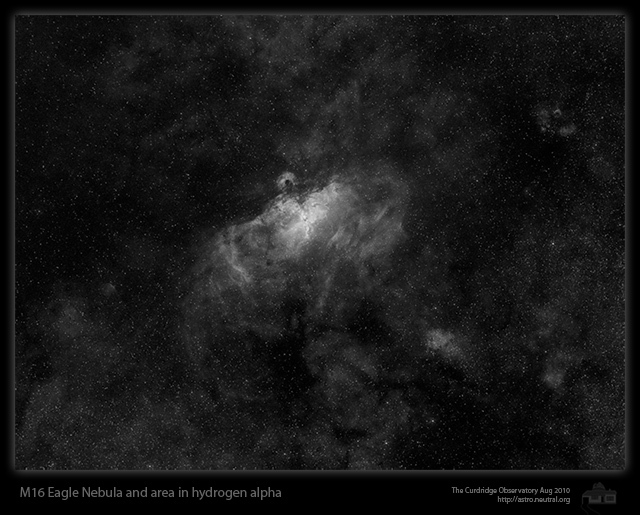 Even imaging it at 20 degrees elevation I could see the central nebula clearly on 1 second 4x4 binning framing shots. Signal wise the central portion is a very easy target - if this object was in Cassiopeia or Cygnus then it would probably be up there with the North American in imaging popularity. I used data from two nights to produce this image. I am quite pleased with the result considering how much muck I am shooting through. When your eye follows the line of the scope, all you can see is orange haze and not a single star. The power of narrowband filters to get a decent image out of terrible skies is always of constant wonder to me. The Eagle Nebula is of course the target of one of the most famous Hubble images - the Pillars of Creation shot. Well, the pillars are in there, right in the middle - you can just make them out. The attraction of these features is probably the reason you don't see so many wide field shots of this region.